A few weeks ago, I was sitting at a Starbucks enjoying my morning coffee and toasted sandwich. This was after a long bike ride so the meal tasted exceptionally delicious. As I was eating, I realized that the body of Christ was a lot like my sausage egg and cheese English muffin. With the English muffin as its core, the slowly simmered sausage and the carefully melted cheese on the egg defined the sandwich. Unseen to the consumer, various spices such as oil and salt were also used in the process. Each of these ingredients played a different role, but they all worked together to represent its chef in service to others. My experience on PaLM’s short-term missions trip resembled a finely crafted English muffin. Every year a team from the NY/NJ Metropolitan area is sent to the Navajo Reservation in Arizona to share God’s love and plan of salvation. This year, the team consisted of fourteen members. Although this quantity deviates from the normal twenty-three or so people, it was a number that amplified the body of Christ. After several training sessions, the fourteen of us headed off to Arizona. The day we arrived was only a couple of days after my annual church retreat. This meant that I was facing the mental and physical fatigue accumulated during the four days at the conference. As I looked ahead to the next 10-11 days, I did not know how it would be possible for me to serve God on this trip to my fullest capabilities. One of the main concerns I had was the lack of human resources. There was a limited number of workers for the tasks that needed to be done. It was like preparing a meal on Top Chef without enough time and ingredients. Lessons needed to be prepared, cooking and cleaning needed to be done, skits needed to be practiced, and trips needed to be planned in the limited amount of time that was available. Not only that, but it was also expected that the work we did would be presentable. Before the missions trip even began, I felt overwhelmed with the number of tasks that needed to be completed. The Lord, however, was gracious. Within days of leaving, God comforted my fears by showing me what the apostle Paul meant when he wrote Ephesians 4:11-13. It says that Christ equipped the members of the church with gifts “to prepare God’s people for works of service, so that the body of Christ may be built up until we all reach unity in the faith and in the knowledge of the Son of God.” Everyone on the team was a different ingredient that the chef used to create a delicious meal that was worthy of being served. In our small team, one person was in charge of cooking, another was assigned to cleaning, and yet another was given the task of leading the VBS, and still others had the role of driving. Besides the roles that could be seen outwardly, there were many different seasonings that were not visible but were nevertheless vital, such as encouragement and prayer. For you see, back in the compound, the first thing I noticed upon arriving was a swing set. It wasn’t anything fancy. In fact, it was anything but fancy. It had chipped red paint, squeaking chains, and 2 out of the 5 swings were no longer functional. However, that was also what made it attractive, at least to me. And a few yards from the swing set stood a flagpole. Every morning I would do my quiet time on the swing as I watched the sun completely rise. Afterwards, I would swing for a while. And my goal was always to reach the flagpole even after knowing full well it was impossible. The main reason I treasured that space was because God met me there every morning. And the more time I spent with Him, the more I leaned on His promises. Sooner than later, I started to wait in expectation for God to provide and provide He did. Steve led Eddie to Christ. their vote to see if we should go. We voted in favor of going but with much reservation. So that night, we prayed together and ask God to lead us by faith. Our journey had begun. responsive. We prepared as much as we could with the assignment that was placed upon us, but our family really did not know what to expect from this trip. We were anxious because we have never been to the reservation before, and know so little about it. The day came for the trip, we all gathered in the airport early in the morning to catch our flight. Our team was together, physically and spiritually, from that point on until the end of the trip. One lesson God has taught us is how important the team was to each other. It is so amazing how God brought together this group of people from different churches. God really taught all of us how important our actions and words are to each other. The words of encouragement lifted our spirits and helped bond our team. I found a lot of joy working with this team. The spirit of God was truly leading all of us. 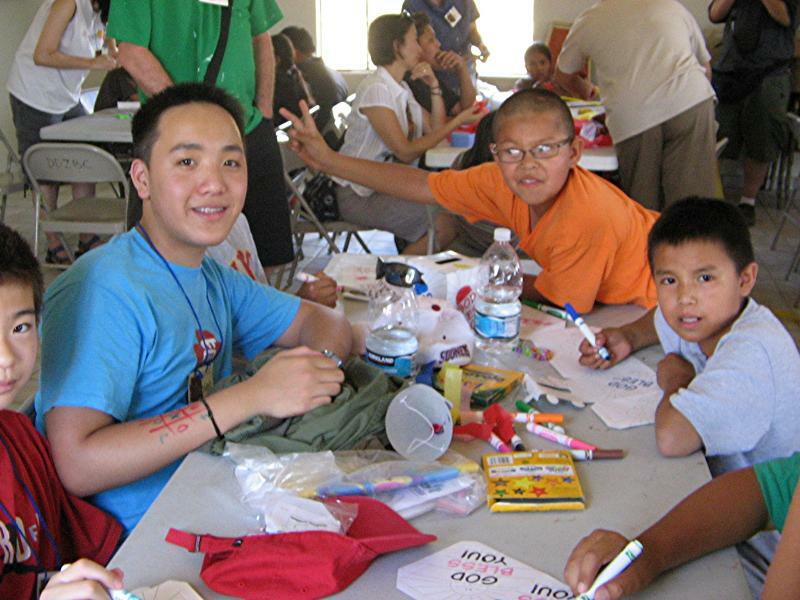 The most nervous time for us on this trip was the first day of VBS, where we meet the Navajo people for the first time. One of the reasons why I had hesitated going to this mission trip was that I did not initially have a burden for the Navajo people. How could I? I never met one. Well, as it turns out, after finally getting to know some of the Navajo kids and adults, it was already time to go. The kids were so precious and friendly. The adults have had their share of hardships. Here again, God taught me that we should not base our burdens on our own feelings. We need to align the center of our hearts with what is in the center of God’s heart. And at the center of God’s heart is the burden for all His lost. As I mentioned earlier, I was nervous that the Navajo were very quiet. Praise God, through God’s work and the commitment of PaLM and all the supporters to continue their relationship by coming back each year, the heart of lot of Navajo’s were already opened for us to get to know them and to share the Gospel with them. The enemy does not want us to share the Gospel with the Navajo. There is a spiritual battle out here. Please pray that God will continue to open doors for PaLM to continue the relationship with the Navajo. We pray that God will open the hearts of many Navajo people to forgive what has been done to them, whether by America or by missionaries; that God will heal them and draw them to Him. Jonah 4:11 But Nineveh has more than a hundred and twenty thousand people who cannot tell their right hand from their left, and many cattle as well. Should I not be concerned about that great city. Is it God or me? Because often I think I am more than capable. To work hard to obtain and ensure success. Falls short of the model God intended. The Father, Son, Spirit - in unity. Of one heart and mind - a community. Living, serving, and playing together. Each with a unique personality and character. Every imperfect part possessing a role. To shine for Him and to bring Him glory. Of the mighty and wonderful things God truly can do. I believe that going on any missions’ trip is taking a step outside our comfort zone. But, the experience of going on such a trip also grows us closer to our Lord and to each other, for the glory of God. I went on my first missions’ trip to Arizona with seventeen other team members. I went praying that God would use me to spread the gospel of Christ to the Navajos on the reservation. God is good. Even before I left for the Reservation, He provided my fundraising and prayer support. That was already an encouragement, followed by other blessings from the trip. I co-taught 2nd-3rd grade tutoring and VBS. I learned to be flexible in our tutoring classes, accommodating and changing the lessons to fit the kids better. We had times to play and get to know each other better. The Navajos were friendly and open to our presence, actions and words. In our VBS classes, we reviewed the basics of who God is, who Jesus is and who the Holy Spirit is. Our team was there to share the good news of Jesus and bring them one step closer to God. When the kids had questions, I would answer as best as I could and prayed that the Holy Spirit continued to work in each of them. I was proud of the kids in my class for memorizing Romans 5:8 and reciting it at the potluck dinner on Thursday evening. The Navajos are a simple, humble people. But since sin exists, they are also a broken people who need Jesus. Even as Christians, we aren’t perfect but by God’s grace and Christ’s sacrifice, we are restored and forgiven. The two weeks in Arizona seemed to start slow yet end too fast. It was a blessing to serve the Navajo alongside my team members and to be challenged daily to take up my cross. I praise God for protecting us during our time there! 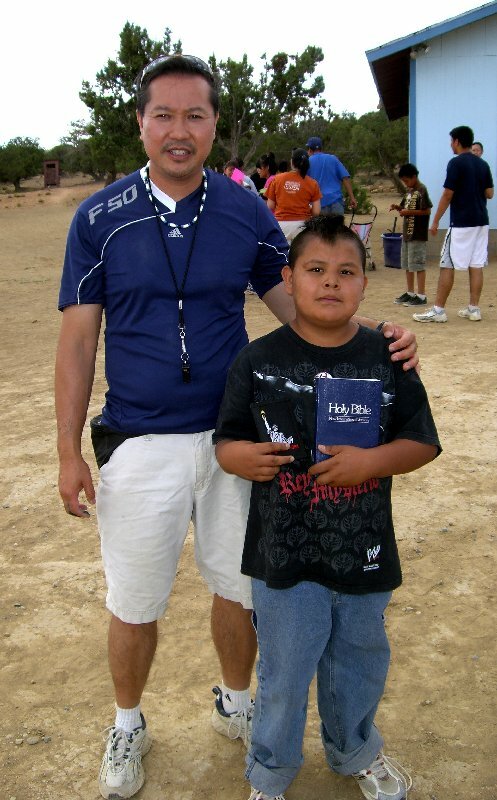 Going on this mission’s trip has put the Navajos closer to my heart as we shared Christ’s love in words and actions. I am thankful for the work that God has started with the previous teams and know that God will continue to grow the planted seeds of faith through our team and future PaLM teams. I had been looking forward to the Short-Term Missions trip to Arizona for weeks before we actually left for it. Hearing all about the Navajo people, what we were going to be doing on the Reservation and getting to know my awesome team members during training sessions gave me extremely high expectations for the trip. Little did I know to what extent my expectations would be fulfilled and ultimately exceeded. This year, we were told that the trip would be very different than past years, in that we would be both teaching VBS and conducting tutoring. I was anxious about this arrangement—especially about being well prepared and ready enough to teach the 4th-6th grade boys. However, tutoring actually went very successfully. My co-teacher, Spencer, and I were able to help each boy almost individually. Although the addition of tutoring to our schedule doubled our workload, it was a great chance to form a personal relationship with the boys and let them know that we weren’t only there to teach them about God and be through with our trip. I am so thankful that we had this opportunity to get to know each boy well through tutoring. Teaching VBS was also a big challenge. It took place after tutoring and after lunch, when most of the team was already very tired from teaching tutorial and running around with the kids the whole morning. Also, it goes without saying that it was a hard task to keep the boys’ listening with their short attention spans. Because the majority of them were ages nine or ten, stinkbugs, Wal-mart and “when can we have snacks” often became the topic of conversation in our class. However, when Spencer and I asked them about their faith, many of them said either that they were Christians already or that they understood salvation better. Many of the boys have been coming to PaLM’s VBS for several years in a row, and I experienced firsthand God’s faithfulness in nurturing the seeds planted by teams from past years. Some of my fondest memories of the trip come from the time spent with the team, whether in the van, in the Big House, cooking, cleaning or playing with the kids. They were a blessing to me. The younger team members were really fun to be around (the adults were really cool too!! ), and they filled our trip with laughter and made it that much more enjoyable. I was so encouraged by their willingness to serve despite the heat and their tiredness. The adult team members and “veterans” of the trip led our group with humor and fun attitudes and bestowed their various nuggets of wisdom on the younger members. They also worked their hardest even when completely exhausted. Pastor Howard and Auntie Fay (along with their whole family) and Auntie Yan’s willingness to come back to the reservation each year and minister to the Navajo is an extremely inspiring example of faithfulness. The group also taught me an important lesson—the necessity of fellowship and mutual prayer. This was made evident through our nightly meetings where we shared about the events of the days and some prayer items for the Navajo. And the kids…what can I say about the kids? Playing and hanging out with them was definitely my favorite part of the trip. They LOVE piggyback rides, so the phrase I heard most throughout the trip was “Can I have a piggyback ride? 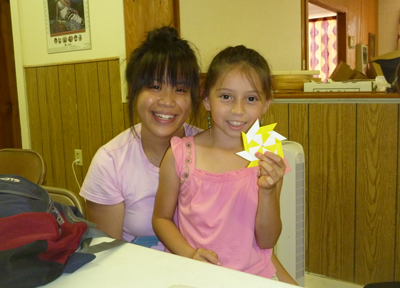 !” When it was time for them to leave on the last day of VBS, I was so reluctant to say goodbye. Many of them are so needy, and yet they are content and find happiness in the smallest things, things that we take for granted every single day. Seeing their smiling faces and contagious joy every day was such a great experience and it’s the thing I miss the most about this STM. The two weeks I spent in Arizona were incredible. God taught me so many things about myself, about Him, and about serving Him. Now, whenever anyone mentions stinkbugs, or Wal-mart, I smile and remember the great time I had in Arizona with the Navajo! As cliché as this may sound, God never ceases to amaze us with the completion of His Plan in all circumstances; His plan is essentially the only plan. This summer at Arizona was another opportunity for me to see the power of God in action in my own life. Bluntly stated, it was pretty complicated and difficult for me to come on this trip. Although I was faced with many challenges along the way, I was also able to learn/grow from these challenges. I was actually part of the Spain team, which in the end got cancelled. My attitude towards that at first was to get angry and disappointed in God. I had switched around my summer plans in order to fit in that trip and now it was getting cancelled. It was hard for me to understand God’s plan at that time, but praise God for working in His ways and showing that He is the one in control and for giving me the great opportunity to join the Arizona team. Joining the Arizona team, I had somewhat low expectations due to the fact that the trip to Spain was cancelled. Reflecting back on the Arizona trip now, I’ve realized that my only expectation was to “get a lot” out of it; to be stretched outside my comfort zone, be challenged/changed, and see more of God’s mercy and the works of His hands. I was challenged as I learned about the Navajo culture and their lifestyle and then learned to be able to relate and talk with them. I had never gone on a short term missions trip with adults before, so that was a challenge in itself- to be able to talk with the rest of the team and build lasting relationships with them. Lastly, I saw so much of God’s beauty in His Creations, everything from the sunsets, to the vast desert plains, to the cactus plants, the rock structures of the Grand Canyon, the relationships that formed between our team and the Navajo people, and the smiles on each of our faces at the end of each day.